This is the last thing I say to my girls every single day as they leave my care. It is often jotted down on their little lunchbox notes. It is one of the most important things that I wish to impart to them. Being kind, sweet, caring, loyal. I want them consciously looking for someone sitting alone at the lunch tables. For someone needing a friend to play with at the playground. I want their lives to be marked by these things. I want them to notice the hurting and lonely around them. I want their hearts to break to the point that they will do anything to draw those on the fringe in. Regardless of what their peers might do or say. I will say this phrase one hundred billion times if I need to. Because that is the kind of hearts that I want to see in my girls. Those are the kind of qualities that will carry them from childhood, on to high school and then to adulthood. The culture of "mean girls" does not start in the teen years. I don't know if it is an innate tendency of jealousy or competitiveness, or a product of society. What I do know, is that attitude starts much, much, much too young. Honestly, that is devastating to me. Knowing that I am raising three girls in a world that often pushes against good. Against right. So if a few words from my mouth each day, accompanied by a big hug, and hard fought eye contact, means that there are three less mean girls in the world, I can consider my toil worthwhile. Yes! We must be intentionally building into young hearts daily to help them recognize the difference between Life and Death in our words. Couldn't agree more. Thanks for the post. I think this is really sweet. It is so true about "mean girls" in schools today. It does make me rather nervous to send my little girl off to school, but seeing that you are committed to keeping your daughters grounded is incredibly reassuring to me. Thank you so much for being such a great parent. There should be more people like you in today's society. Veyr true! When I was little my granny instilled in me to be friends with everyone. And I can honestly say that to this day I am friends with everyone. It doesn't matter what you look like, how much you have or don't, your homeless, a wreck,whatever we are friends! And I can't thank my granny enough for giving me that preciuous gift!! I am so glad your girls are learning that gift!! Woohoo! I got excited finishing this blog. It's exciting to see people who are teaching their children to go counter culture. We've gone a L O N G way away from the values and morals that made this country great and it is refreshing to see parents making a change! Your daughters have a wonderful Mama!! Very sweet-I have two girls, and the mean-ness is already alive and kicking in my very innocent 5th grader's class. Even her friends are constantly looking to take her down-questioning her clothing, criticizing what she eats....so weird. Why can't they be content to be happy children? since henry has started kindergarten i have felt the same way- that society pushes against good- and it makes me so sad, but your words are uplifting. they are such a great reminder to that we can set our kiddos hearts on the right path now instead of waiting for the scary tween/teen years. Once again I say you are a good mama...let the weight of those words linger friend because they are true. I am gleaning your wisdom today. A girlfriend of mine tells her little to 'prefer others'...is that not precious! And this is why I love you so much! This is exactly what I want for Brayden too. Bookmarking this post so I have it ready when B goes off to school. You are awesome, my friend! You are awesome! 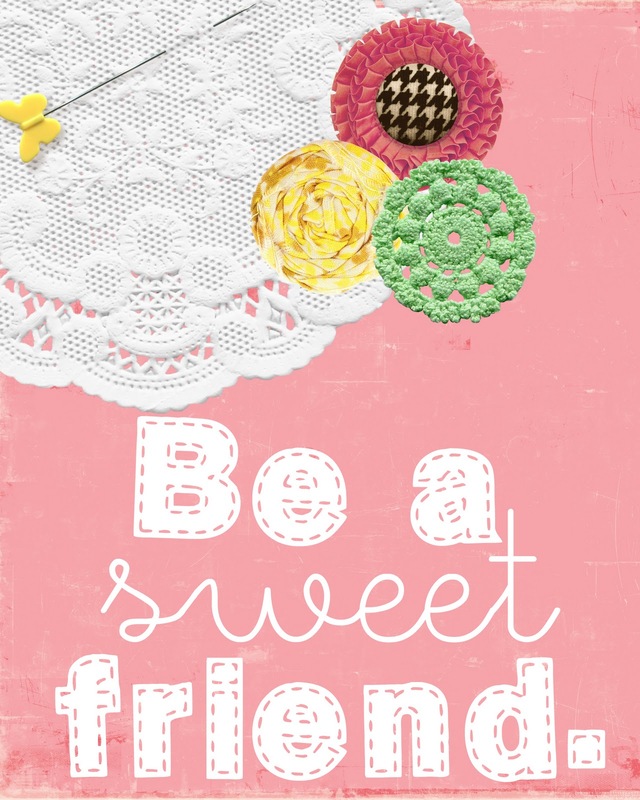 And you ARE a sweet friend!! I worked with kids for over 10 years from ages 3 to 13, and you're so right. The "meanness" starts at 3! Great job working on their heart & character and not just their actions! Well said! I worry a lot about my neice who's 10 - and as early as 8 yrs old she was worried about how she looked... it's a harsh world out there. Thanks for teaching your kids to be the nice kids! The world needs more of them! Oh, did this speak to my mama heart today. My daughter, Georgie, is 11 years old. I cannot believe some of things that others say to her because of her name; because she likes to dress uniquely (as in, she still likes to wear clothes that I make for her); she is a vegetarian; she plays a unique instrument (oboe), she is very earth-conscious, etc. etc. I could go on and on. Heartbreaking and irritating. Oh, I just love you. I will start saying it to my daughter. My husband is a junior high teacher and just last night he was telling me about a girl who struggles socially. She was sick for several days and when she came back, she asked my husband where she was supposed to sit. One of the prettiest and most popular girls loudly said, "Here is a lonely seat right next to me just waiting for you to sit in it . . . come here!" My husband said that the look on this girl's face was priceless. A small friendly gesture can make someone feel so loved. You continue to amaze me. Thank you. How hard is it to be kind? When SO much kindness has been given to us! What a lovely daily reminder! It reminds me of a time when I was in preschool and there was a little girl that always sat alone on the playground and I remember telling my mother and said said, Why dont you sit with her tomorrow and ask her if she needs a friend. So I did and she was my friend all through school. I big pink puffy heart you so much right now. The last thing I say to my girls is I love you, but I am going to start adding this...I always tell them to be the friend you want to have. And yes, the mean-ness starts in preschool, sadly..sigh.. Mean mommas have mean girls I am afraid. Thanks for the encouragement and reminder for my 3 girls as well! The daily 'saying' I repeat over and over at our green pastures...."Remember who you are!" You are a daughter of the King of kings! His special princess- represent and shine for Him in all you do and say, today!! Look forward to your posts...Merry Christmas to you and yours. A faithful follower. I love to say something similar to my boys. "Be a good friend" is usually what they here out of my mouth. Maybe I should start adding in other words..."Be a loyal friend" "Look for a new friend today". I too hope for the same things for my boys. It is one of my greatest prayers. Well said. Thank you for reminding me as a mother to make that a part of our daily life. Also, can you clarify how me as a blogger will be able to confirm that someone has donated the $10 to enter? I'm wanting to participate and need to know what to write on my blog for each person to enter. Amen! This is amazing:) I have tried to do the same thing with my 7 year old. You are so right - the mean things starts way too early! My daughter just turned 3 and one day we got in the car from playing at the playground and she said, "Mommy - that boy said I have funny hair." She has lots of beautiful curls. I told her that she was beautifully made and we know how to be kind to others even if they don't know how to be kind to us. I didn't think I was going to have to worry about this kind of thing until she started school at least. Geesh! i love this. i am in school to be an elementary school teacher and this is what i share with my little kindergarteners each day! so so so important. You are an amazing mommy! Your girls are so lucky to have you. I am going to start saying this to my girls! I love this. It's such a scary world out there and now that I have to little ones, I find it even scarier! I worked at a daycare at an elementary school for years and saw this much too often. I want to know why it seems kids are getting so mean so much younger? I too work at an elementary school and it is shocking how mean girls can be. More so than boys, I have seen. Someone said "why can't they be content to be happy children?" Because their parents are not content and happy adults. It starts at the top. Thank you for being an excellent mommy and adult role model. That is so sweet! I totally agree that mean girls don't start as teenagers. We have been trying to tell our kids every day that how they treat the people around them is so important. My little girl has been bullied this year. She's 8! It makes me so angry. Now I am trying to teach her to be polite and sweet, yet not be a victim and stand up for herself. My almost 9 year old and I have conversations about being a friend to the friendless, and kind to her sister and cousins ALL THE TIME. I don't want to raise a mean girl. I want to raise someone who loves people to Jesus. And most of the time she is kind and thoughtful and friendsly. But those moments where the mean girl rears her ugly head, are well, ugly. I just keep reminding myself that everytime that ugly sides pops out it's ugly head I have the chance to teach her a lesson. So even though I HATE SEEING that sin part of her peek out and snarl at the world, I remember to thank Jesus for the chance to train my daughter in the way she should go, not the way her sin nature wants to go. Beauty. Thank you for sharing and making the world a sweeter place through your girls and the women they will become! I love this. Being a good example is important, but these daily reminders are such a great idea! We pray on our way to school each morning and each morning I pray that my kids will be their kindest in the way they act & speak to everyone they come into contact with. I pray that they will be Jesus in their school. Every day my kids hear that on the way to school and I pray it sinks in. It makes me happy to know there are other mamas out there sending their kids off with the same words whispered in their ears. You are so encouraging- thank you for taking the time to blog! I tell my 13 yo son the same thing and have ever since I can remember. It only gets tougher to instill as they get older when that peer pressure comes on stronger. Girls OR boys, kids can be SO MEAN!! You know that movie - Mean Girls - I hate it and my husband can't understand why I have such strong feelings about it. He doesn't understand. He's not a girl. I'd much rather be punched in the face like boys handle things. I'm thankful you're raising nice girls. I am not quite sure how I stumbled upon your fantastic blog, but I'm honestly smitten. Your style, your love, your fantastic-ness! Keep on keeping on. As a Mom of two SMALL girls I can completely relate. Keep on keeping on! Thank you for being YOU. Oh that is so, so great. I am going to start this with my girls right away! love it. my mom's lunchbox napkin phrase was "to have a friend, you must be a friend". yeah, i'll take a copy of this print too please. nope, i'll tell you when it starts: grade 3. mean, mean, mean girls. yep, grade three, all the way up to grade twitter. rock on! i love this. Love this post so much. EVERYDAY I tell Leila "be kind to everyone" That's our little phrase. The fact that the whole "mean girl" mentality starts so early truly breaks my heart. ps - what font did you use for the cute pic?? I loved this post. My children are 2 and a half and one and I feel like there is so much I want to teach them but I start to feel like I'm already failing them and I need a do over. I just want to be the best mother and give them a great childhood and teach them how to be good people.